Burnt Store Marina Inside - The inside look of Burnt Store Marina in Punta Gorda, Florida. See the boat traffic, weather and a nice pool view of the Marina. Bokeelia, Florida: Four Winds Marina, 7.3 mi. Bokeelia, Florida: Bokeelia Fishing Pier, 7.5 mi. 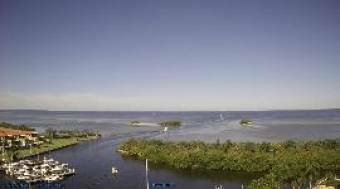 Matlacha, Florida: Matlacha Pass, Florida Coastal Webcam, 8.7 mi. Matlacha, Florida: D and D Bait and Tackle 1, 9.2 mi. Matlacha, Florida: D and D Bait and Tackle 2, 9.2 mi. Cape Coral, Florida: Weathercam, 9.3 mi. Punta Gorda, Florida: Punta Gorda Weathercam, 12.4 mi. Placida, Florida: Gasparilla Marina, 13.8 mi. This webcam Burnt Store Marina, Florida with the theme Harbors was added on June 19, 2014 and is operated by CapeWeather. It got 341 visitors since then. Shouldn't this webcam work or should the link be wrong please report that here. You can add this webcam here to myCams.